The Gerber Big Rock is a high-quality, all-purpose fixed blade outdoor and survival knife that particularly excels in hunting applications. 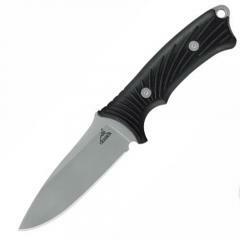 The broad, full tang plain edge blade is extremely strong, perfect for heavy-duty use. It combines a sharp piercing point with a long cutting belly, making it highly versatile. The handle is made from glass-filled nylon with a textured SoftGrip overmold layer, preventing it from slipping in your hand and improving comfort. Its ergonomic shape, molded finger groove and large guard provide an extremely secure grip, and the lanyard hole at the base fits 550 paracord so that it can be lashed to the wrist for improved retention. The knife comes with its own ballistic nylon sheath with an insert for enhanced protection.